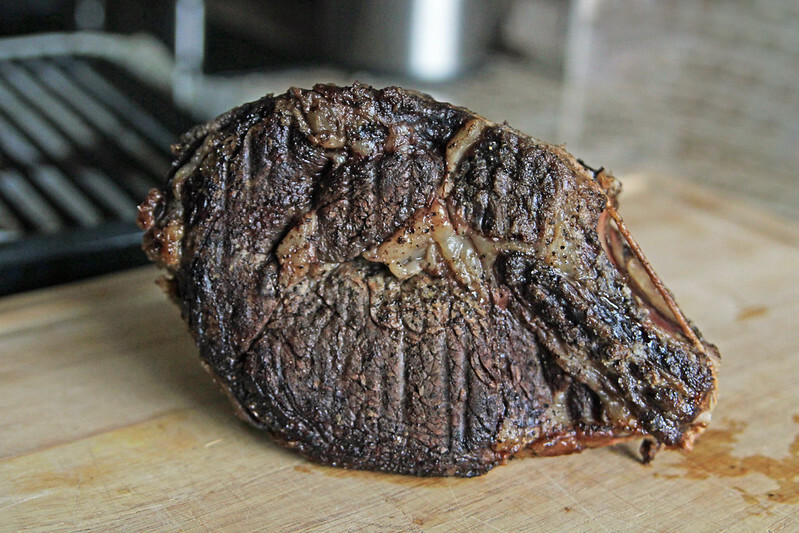 I didn’t want to toot my own horn by titling this “Perfect Prime Rib”, but I have honed how to cook oven roast prime rib over the years to perfection, if I do say so myself, and I wanted to finally share it with you. It’s always hard to take decent photos when I cook this meal for Christmas Eve supper, so I’ve been buying these little family-sized prime rib cuts from our local grocery store when they have them on sale. I’ll never go back to an inside round oven roast again — there’s no comparison! 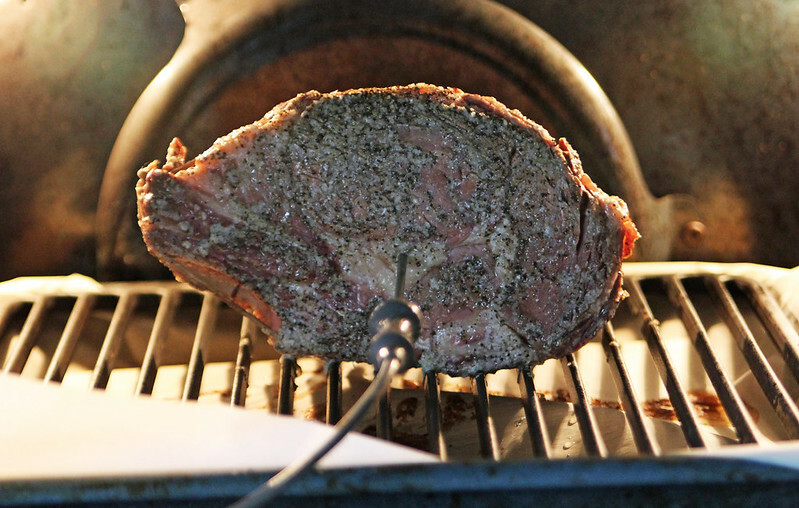 Now, let’s take it step-by-step, picture-by-picture on how I cook oven roast prime rib. This particular roast is very small, not quite 2 lbs/1 kg, so it takes a lot less time to cook, but is prepped the same was as I would a large roast for a holiday meal. 1) Allow meat to sit at room temperature for at least 1 hour, you don’t want to put cold meat into a hot oven; it will cook more evenly! 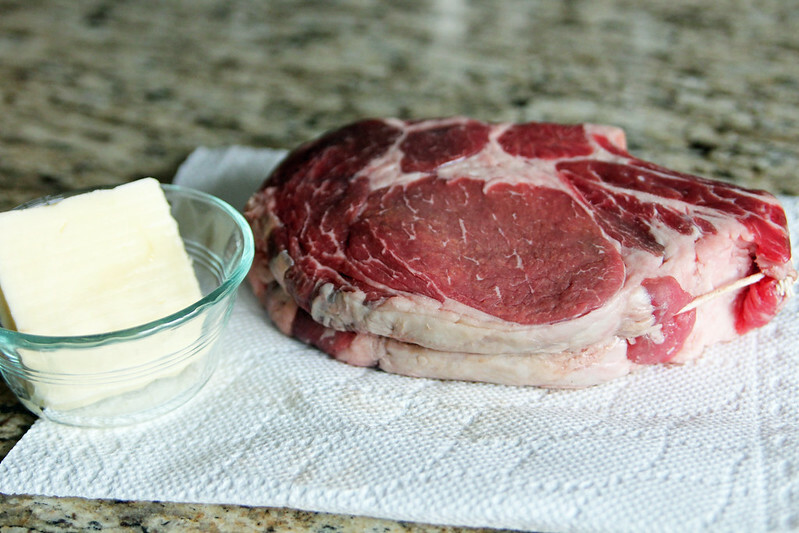 Take your butter out to sit at room temperature too, the amount you use will vary on how big your roast is. 2) Preheat your oven to 450ºF and remove excess moisture from roast with a paper towel and introduce your friends butter and beef. 3) Have a shallow roasting pan with a rack ready to go, I like to place parchment paper under my rack for easy clean up. Rub room temperature butter all over roast, it may need to be massaged and coaxed in a bit, but helping to remove excess moisture and having butter at room temperature really helps ease this step. 4) Get a shallow bowl, I like to use a glass pie plate, and generously sprinkle kosher salt and pepper in it and place buttered roast in the plate. 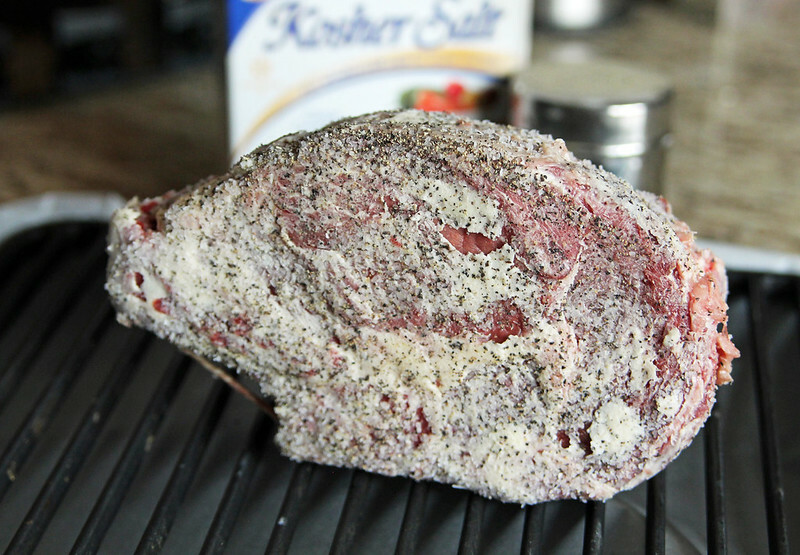 5) Flip roast over and sprinkle more kosher salt and pepper to cover top and sides. 6) Place roast fat-side up (this may not be possible with a smaller roast like the one shown here, and that’s okay) onto your roasting rack and insert meat thermometer into centre of roast, avoiding fat and bone. 7) Place roast in preheated oven and sear for 10 minutes at 450ºF. 8) Turn oven temperature all the way down to 250ºF and cook to *desired doneness, a roast this size (1 kg) only takes about 1.5 hours at most, so I even cook at 225ºF for a roast this size to go nice and low and slow. 9) Take roast out of oven, cover with tinfoil and let rest 10-15 minutes and then slice as desired! This roast was done earlier than I anticipated and not as medium/red as I wanted it in the middle, but it was still absolutely delicious! There will be little to no drippings, in my experience, but there’s no need for gravy or au jus, in my humble opinion! 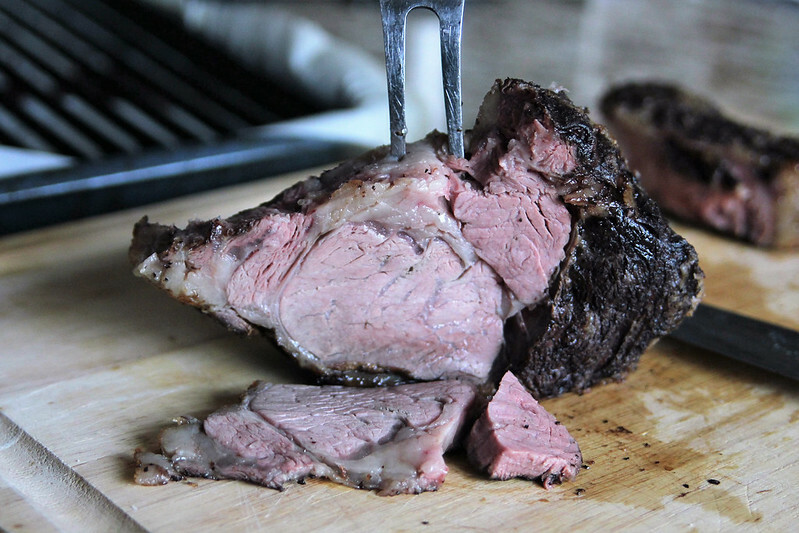 The perfect oven roast prime rib! 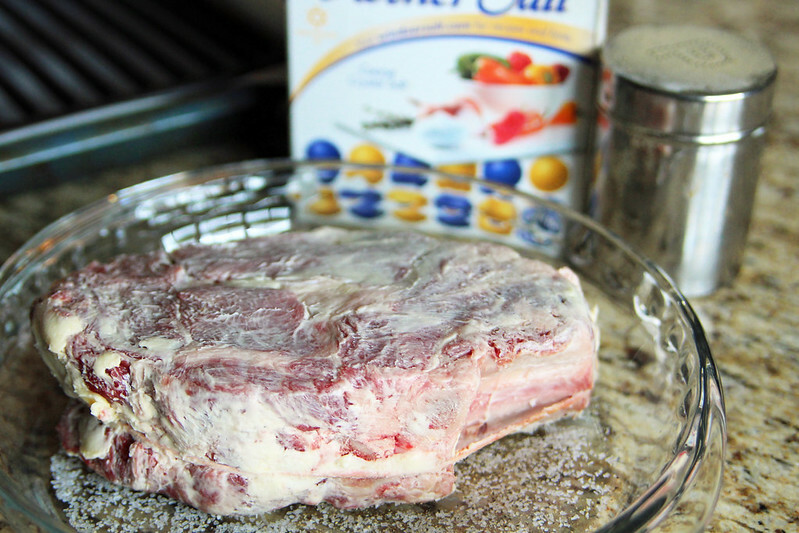 Butter-rubbed meat, seared to perfection and seasoned with kosher salt and pepper is all you need to make a juicy, flavourful prime rib roast! Allow meat to sit at room temperature for 1 hour, you don't want to put cold meat into a hot oven! 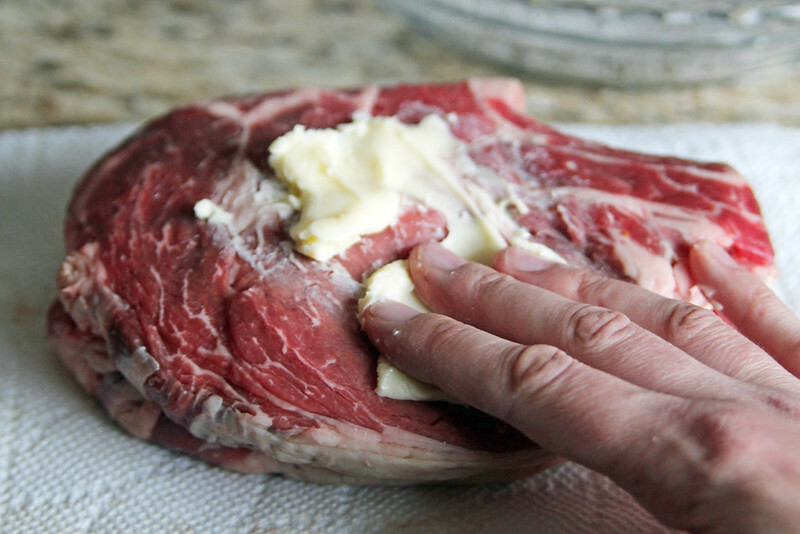 Take your butter out to sit at room temperature too, the amount you use will vary on how big your roast is. Preheat your oven to 450ºF and remove excess moisture from roast with a paper towel and introduce your friends butter and beef. Have a shallow roasting pan with a rack ready to go, I like to place parchment paper under my rack for easy clean up. Rub room temperature butter all over roast, it may need to be massaged and coaxed in a bit, but helping to remove excess moisture and having butter at room temperature really helps ease this step. Get a shallow bowl, I like to use a glass pie plate, and generously sprinkle kosher salt and pepper in it and place buttered roast in the plate. Flip roast over and sprinkle more kosher salt and pepper to cover top and sides. 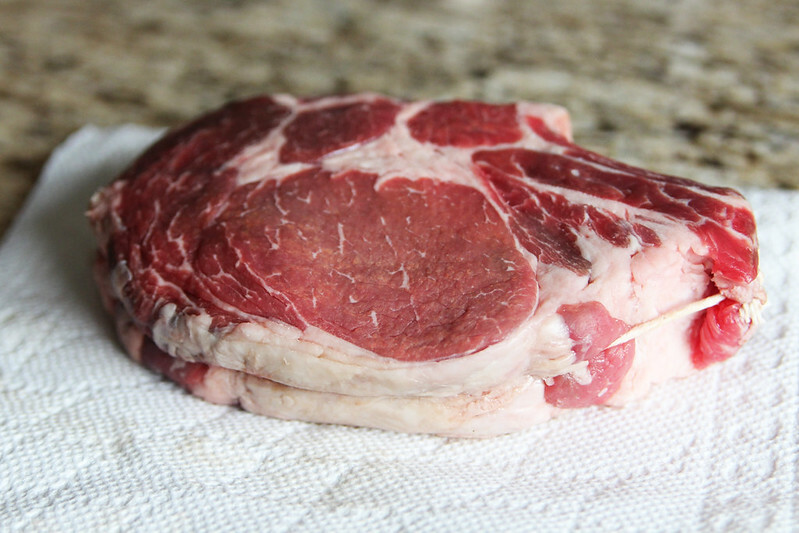 Place roast fat-side up (this may not be possible with a smaller roast like the one shown here, and that's okay) onto your roasting rack and insert meat thermometer into centre of roast, avoiding fat and bone. 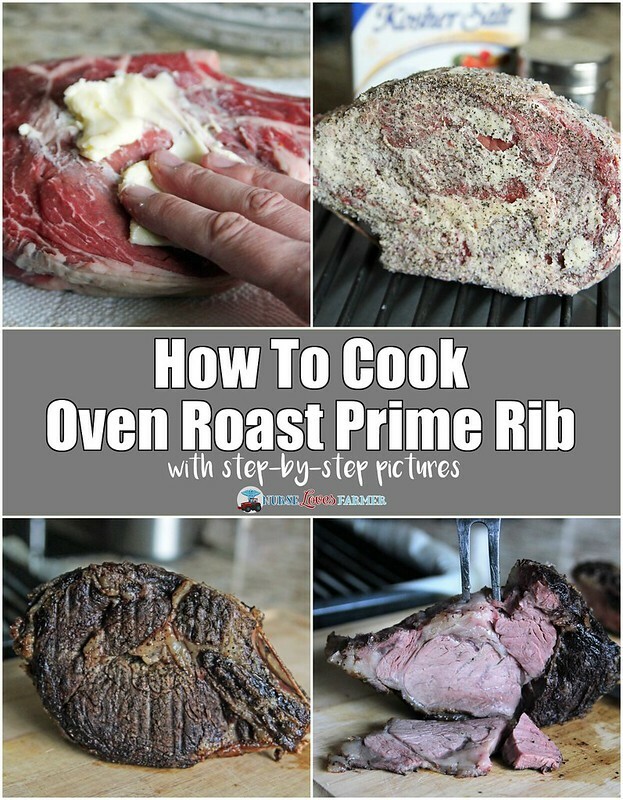 Place roast in preheated oven and sear for 10 minutes at 450ºF. Turn oven temperature all the way down to 250ºF and cook to *desired doneness, a roast this size (1 kg) only takes about 1.5 hours at most, so I even cook at 225ºF for a roast this size to go nice and low and slow. Take roast out of oven, cover with tinfoil and let rest 10-15 minutes and then slice as desired! *Desired Doneness - Per Health Canada regulations cook to medium-rare 145ºF and medium-well done 160ºF. I usually take my roast out at 150-155ºF and let finish cooking as it rests under tinfoil. This is how we like it and how my oven works. I know a lot of websites, and especially food bloggers, urge you to take it out while it's still very red and bleeds in the middle between 120ºF and 130ºF, but I just can't bring myself to take meat out that red. If that floats your boat, have at it, but be safe! *Desired Doneness – Per Health Canada regulations cook to medium-rare 145ºF and medium-well done 160ºF. I usually take my roast out at 145-150ºF and let finish cooking as it rests under tinfoil. This is how we like it and how my oven works. I know a lot of websites, and especially food bloggers, urge you to take it out while it’s still very red and bleeds in the middle between 120ºF and 130ºF, but I just can’t bring myself to take meat out that red. If that floats your boat, have at it, but be safe! For cooking guidelines I referenced Canadian Beef. Almost everywhere I’ve ever read says DO NOT add salt, it dries out your meat!! 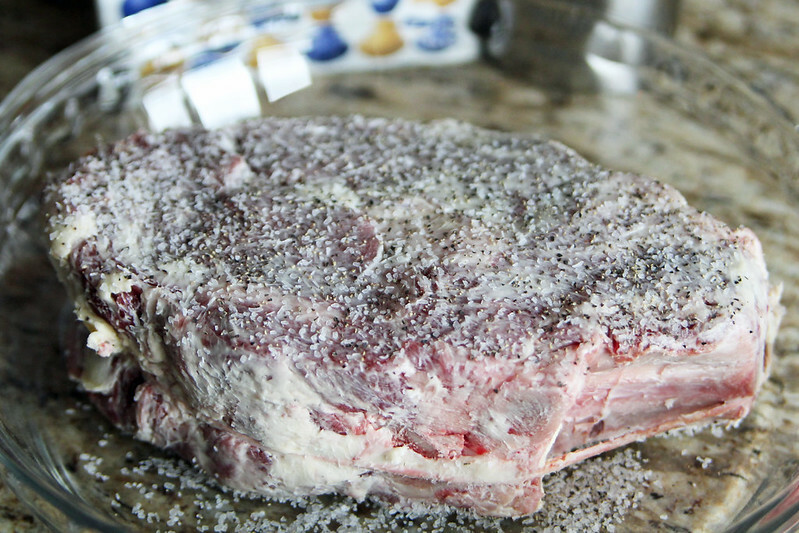 I happen to have a love affair with salt, especially the flaky texture of kosher salt, so I never skip this step and have found if you pay close attention to your meat thermometer, it doesn’t dry out a really good cut like prime rib. Feel free to skip the salt and pepper altogether if you want, but this is how we love it! Heck, if you really want, try a garlic rub or adding rosemary or whatever seasonings you want – but butter, salt and pepper is all we like and need for our oven roast prime rib. Hope you enjoy if you try!